BUGATTI is characterised by its unusual blend of sportiness and elegance, sophistication and a refusal to compromise, history and modernity, as well as constant progression. Founded in 1909 by the pioneering Ettore Bugatti, the company looks back on a long history almost unmatched by any other luxury brand. This history continues to serve as inspiration for a company that follows its founder’s spirit. The limited-edition CHIRON SPORT “110 ANS BUGATTI” ushers in the celebration of BUGATTI’s incomparable 110-year history. Every detail of the CHIRON SPORT “110 ANS BUGATTI” is a modern interpretation of technical excellence and the iconic elegance of historic automobiles, as well as an homage to BUGATTI’s heritage and its home in Molsheim, France. As a renaissance of the legendary hyper sports car, the CHIRON SPORT “110 ANS BUGATTI” fits seamlessly into the ancestral gallery of an equally legendary brand and plays with its unmistakable characteristics. Take the aluminium Signature line around the passenger compartment: such an integral part of the BUGATTI DNA, it is painted in Steel Blue, setting it apart from the front of the car. 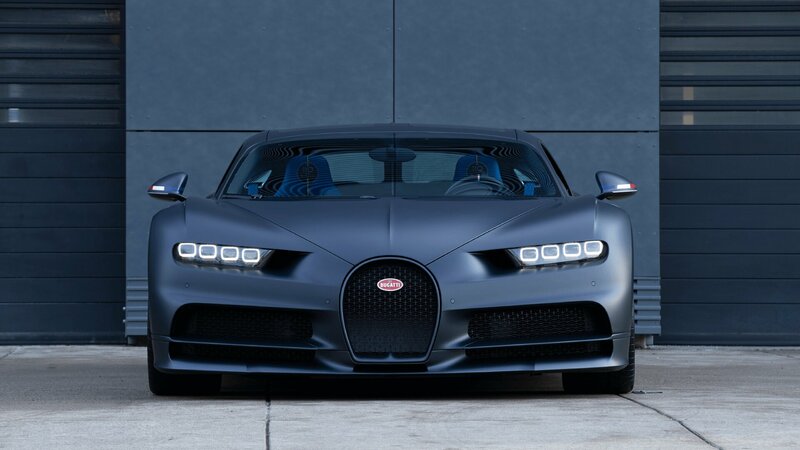 The body and front end of the CHIRON SPORT “110 ANS BUGATTI” are made from steel blue, matt exposed carbon fibre. The same Steel Blue paintwork, produced in a special, complex process, also shimmers at the rear of the car, subtly emphasising the unmistakable two-tone colour scheme reminiscent of historic models. In the 1920s, this type of paintwork was a sign of luxury and exclusiveness; now it signals a sporting character and high level of technological skill. Covering the entire underside of the rear wing, the French flag proudly displays Bugatti’s origin. … the matching matt black sports exhaust system hints at the uncompromising dynamics. Above the driver’s and passenger’s seats, the sun streams through two “Sky View” fixed glass panels – a standard feature of the special edition that is normally available only as an option. The newly developed laminated structure, made with thin glass and four intermediate layers, insulates the CHIRON SPORT “110 ANS BUGATTI” acoustically, while radiation is filtered out and the tinted glass prevents dazzling. For even more driving comfort, the “Sky View” lends the CHIRON SPORT “110 ANS BUGATTI” 2.7cm (1 inch) of extra headroom. The limited-edition CHIRON SPORT “110 ANS BUGATTI” emphasises the company’s French heritage. One of the most famous symbols of the proud nation, the Tricolore “Le Bleu-Blanc-Rouge” decorates the body and interior of the hyper sports car in numerous places. Since the end of the monarchy, it has represented the French Revolution with its famous ideals of liberty (blue), equality (white) and fraternity (red). “Molsheim, in the Alsace region of France, is an essential element in BUGATTI’s brand history and also where we are planning our future,” says Stephan Winkelmann, President of BUGATTI Automobiles S.A.S. The French flag on the wing mirrors reflects the arrangement for the country’s official vehicles, on which the two standards have the blue of liberty to the fore. Sandblasted and polished by hand for a perfect finish, the aluminium filler cap features the colours of the French flag, punctuated by the “110 ANS BUGATTI” emblem. The font combines gold and silver, symbolic of the way BUGATTI itself always unites contrasts. Behind the alloy wheels painted in “Nocturne” matt black, the brake callipers shine proudly in French Racing Blue. In Ettore Bugatti’s time, this was already the country’s racing colour. Its use on the CHIRON SPORT “110 ANS BUGATTI” represents a tribute to Ettore himself, the gentlemen racers of his era and BUGATTI’s racing successes in the 1920s and 1930s. The interior is upholstered in soft “Deep Blue” leather. The door trims, sides and seat areas of the sports seats are covered in Alcantara. Bright French Racing Blue elements on the contours of the seats, stowage compartments, belt trims and the leather of the power window switches provide a sporting contrast. High-quality craftsmanship in every detail: “110 ANS BUGATTI” is embroidered on the headrests and backrests of both sports seats, together with the colours of the French flag. The sports steering wheel combines matt carbon fibre with a blue leather cover and is adorned by a further French flag at the 12 o’clock mark. Each minute detail celebrates the origin of BUGATTI, offering a glimpse of the company’s rich history: the key of the CHIRON SPORT “110 ANS BUGATTI” is surrounded by three sewn leather patches in the colours of the Tricolore.